A chicken stew of sorts. I don't really like following recipes. All those required ingredients and measurements to follow...it's just too much of a commitment for me. Sometimes I'll find a recipe, decide to try it, pick up the necessary ingredients (some that I don't normally use in my everyday cooking -- heavy whipping cream, for example), and change my mind. The ingredients are left unused and rotten in my fridge by the next week, and I'm left feeling unaccomplished and wasteful. My favorite recipes are those I can use as simply a guide. One that I can tweak, learn from, and even mess up a little without completely ruining the dish. One that I can substitute ingredients for depending on what's in my fridge and pantry that day. One that I can make differently every time. 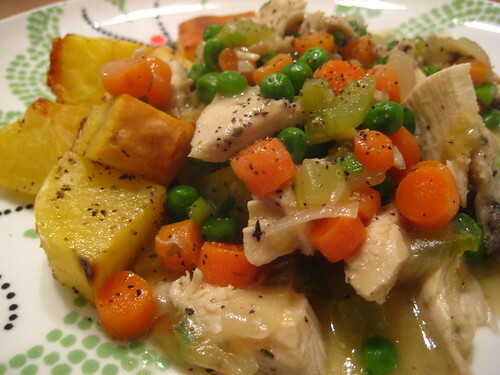 This chicken stew was inspired by a photo and a blog post. The recipe provided on the site is loose and easily edited. And when described as a "crustless pot pie," I was sold. I served my version (onions, carrots, celery, green peas, and a couple of poached chicken breasts) over oven-roasted potatoes. The potatoes were in the oven for an hour, crispy on the outside and soft on the inside, which was a perfect balance of textures to pair with the thick stew. That looks great! My brother made Ina Garten's chicken pot pie for the holidays and it was mind blowing--if you haven't tried it, hurry. thanks, mrob. chicken pot pie is definitely one of those foods that never fails to comfort. Korean dinner at Woo Lae Oak. Fried eggs and fried rice. I eat fried butterfish with my bare hands.